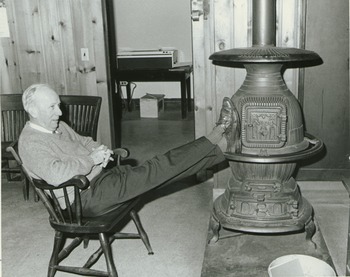 Dr. Chester Ellsworth Cross, second director of the UMass Cranberry Station, with feet on woodstove. Dr. Chester Ellsworth Cross was second director of the UMass Cranberry Station, from 1952 to 1981, with feet on woodstove. Photo 1953. Courtesy Special Collections and University Archives of the W.E.B. Du Bois Library at UMass Amherst.